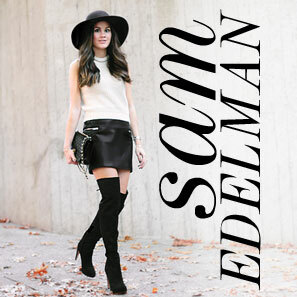 Reaching new heights in these to-die-for Sam Edelman over the knee suede boots! The higher the boot the shorter the hemline is my feeling recently, so pairing this faux leather miniskirt with over the knee boots just feels oh-so-right. Or, should I say, oh-so-mod. Together the combo gives a nod to the short, playful silhouettes of the 60s, a strong influence this fall season that I just can't get enough of! For over 30 years Sam Edelman has been a dominant force in the fashion and contemporary footwear industry, so you can only imagine how excited I am to share that Sam Edelman himself will make an appearance at the downtown Seattle Nordstrom on Thursday, October 23, 2014! Customers are invited to the Women’s Shoe department from 4:00 - 6:00 PM to meet and greet fashion Designer Sam Edelman and view the Fall 2014 Sam Edelman shoe and apparel collection while enjoying lite bites, sips and a live DJ. Sam Edelman will contribute a portion of the day's Sam Edelman sales to the Seattle Children's Hospital - so shop away! Plus, receive a special gift with purchase. See you there! Top, skirt, and boots c/o Sam Edelman.